Before we talk more about best cycling apps, are you a cycling lover? If so, then this is all yours. Many peoples are enjoying cycling and making it even fun by use of different things that they believe will make the whole activity better. Actually, I love cycling, and I am impressed by how fast things are changing nowadays. It is not the same as sometimes back. With the high development of technology across the world, cycling also taking the same trend. What I mean is that there are some new things in cycling that you should know about. One of that is bicycle apps. There are now several apps for both Android and iPhone users. The question is, do you know the best bicycle apps to use? Why Cyclist Need the Cycling Apps? Monitor your training. Various apps are made for this purpose. Record your ride- These are apps designed to record your riding experience. In this case, you will find them developed in a unique form to achieve this purpose. Best Bicycle Apps for Smartphone You Should Know About. In this list, you will find information about different type of apps that will make your cycling experience better. You will find the best tracker app, indoor cycling apps, outdoor cycling apps and also the best mountain biking apps. As the name suggests, it is one of the best cycling apps that you will find. This is a routing app. It is an app that provides you the best routes for you to use with your bike. It makes use of CycleStreets and OpenCycleMaps. This is a smart biking app that is good especially for the beginners. You may find yourself in a difficult situation when it comes to choosing the right bike especially if you are a beginner. You may not know what size bike do you need or you should buy according to your height. This is where the SizeMyBike app comes in. 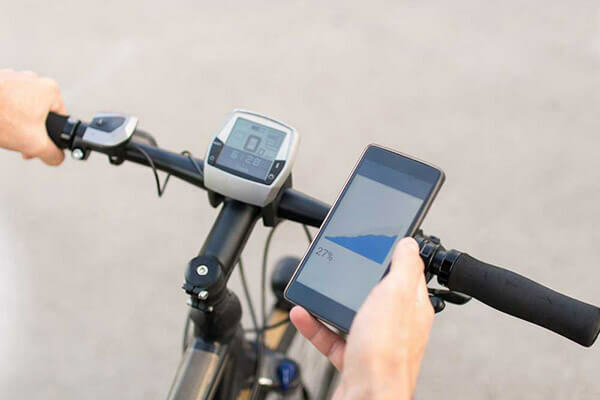 Making use of six different body measurements, if you’re a beginner then the app is able to suggest to you the perfect bike to buy. It is a fitness biking app. We can call it a friendly free cycling app. I will say that there is so much that you get from using this app. The app is made to help you when training using your bike. Here is how it works, the app is for Apple users. It is made in a way it provides the best statistics of your biking experience which helps you to make changes or improve your performance for better results from your training. Some of the things that the app records include your speed, distance and time. It also provides you with recommendations according to your workout when biking. It uses announcement mode making sure that you do not have to look every time you want to know how you are performing. This is a free app and also very useful for bike riders. However, its meant for the London Santander Cycles. It Deals with the hiring of bicycles. It’s the best app when you want to know of the nearest bike or a docking station. In addition to this, the app is handy when it comes to riding. The app helps in determining the best road. You will also find an inbuilt timer that allows you to keep an eye on the usage to avoid overcharges. Download Santander Cycles for iPhone. Download Santander Cycles for Android. This is an app that originates from this best-selling book by the name 100 Greatest Cycling Climbs. It is a very nice app if you are a mountain rider. It is one of the best mountain cycling apps. The app works for both Android and iOS. It helps the user to locate the hills in the publication. Once you ride on these hills, you will receive info ad stat that enables you to gauge yourself against other cyclists. Download 100 Greatest Cycling Climbs for iPhone. Download 100 Greatest Cycling Climbs for Android. Another handy bicycle app that I think you should know about. You will realize that keeping a bike in good condition by maintaining it and repairing it whenever there is an issue can be very challenging. Do not worry. This app provides you with the kind of help you need fixing any mechanical problems that your bike might face. The app contains clear step by step instructions that will help you go through the bicycle even when servicing. Can be used by both iPhone and Android users. Download Bike Doctor for iPhone. Download Bike Doctor for Android. You all know how much tricky the weather can be to the riders. When you want to go cycling, you may not know how far to go because of the weather. This is the kind of app that you need. The app provides you with full details of the forecast. In doing so, you are able to plan yourself. You will know where to go, how far and what to wear. It is compatible with both Android and iOS. 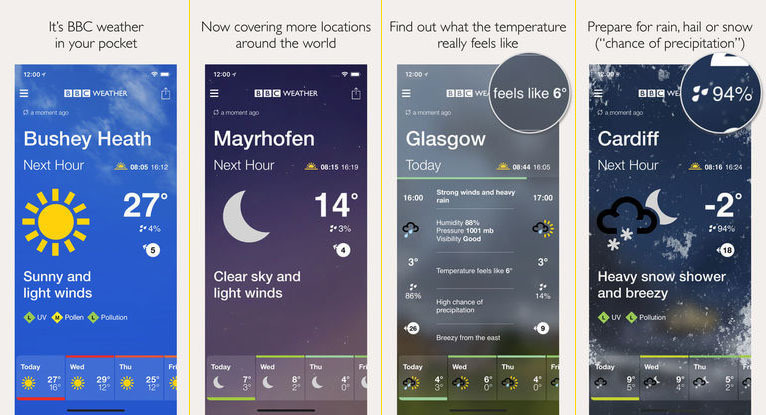 Download BBC Weather for iPhone. Download BBC Weather for Android. You may need this app for some unseen reasons. In some cases, you or a person close to you may experience some injuries related to cycling. In such instances, it might be difficult to determine the best way to deal with the situation. The app provides step by step guidance on how quickly you can treat injuries resulting from cycling accidents. You will also find some detailed diagrams to help out. Download First Aid For Cyclists for iPhone. Download First Aid For Cyclists for Android. This is one that is designed to work with your mobile device. It makes a connection between the Garmin GPS device and your mobile device. In return, it is able to display various data on your phone which may include maps, graphs, and charts. This helps you see your progress the entire time you are riding. Download Garmin Connect for iPhone. Download Garmin Connect for Android. You do not have the struggle trying to find a suitable training formula with your bike. With this app, you are provided with a plan that can help you out to plan better. The app works by plotting the distance and areas that you cover when riding. In this way, you can set longer distances and track your movement. Download My Virtual Mission for iPhone. Download My Virtual Mission for Android. 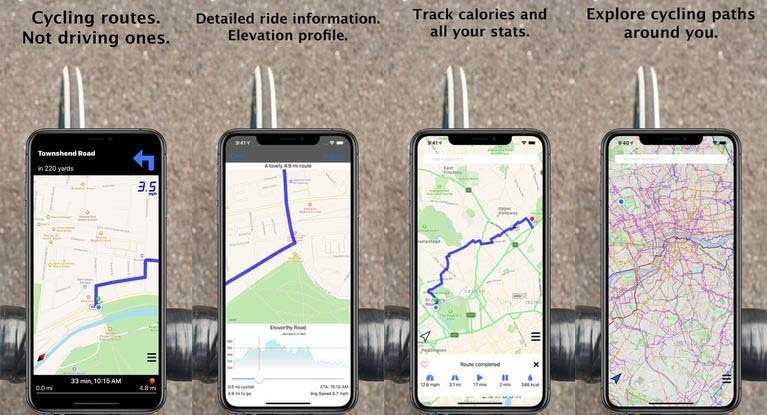 Now I can say that you’ve found all the information about best cycling apps which will make your riding experience more joyful. You can install the perfect Apps for cycling in your Iphone & Android Smartphone as per your riding purposes.